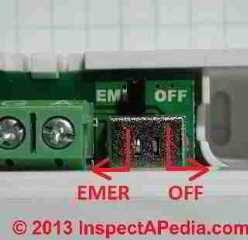 This article describes the purpose and setting of tiny switches found inside of some room thermostats. These little slide or toggle switches may control the heating system on-off cycle rate or burner-on time in a manner similar to the heat anticipator feature found in other room thermostats. Here we describe various types of internal or "hidden" switches found in some wall thermostats and in a table form we summarize their proper setting. In most cases you can safely install a new room thermostat without worrying about these switches - just leave the switch or switches in the factory-set position. But in some circumstances setting the switches correctly may involve a change . 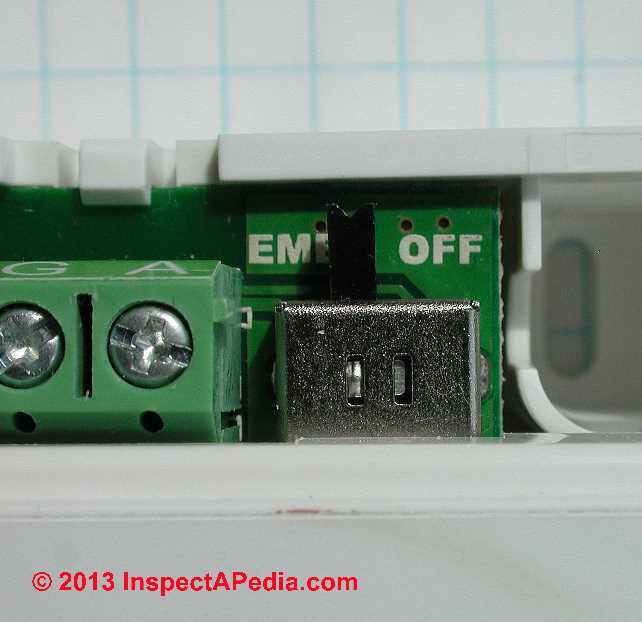 Here we describe various types of internal or "hidden" switches found in some wall thermostats and in a table form we summarize their proper setting. In most cases you can safely install a new room thermostat without worrying about these switches - just leave the switch or switches in the factory-set position. But in some circumstances setting the switches correctly may involve a change . 1. 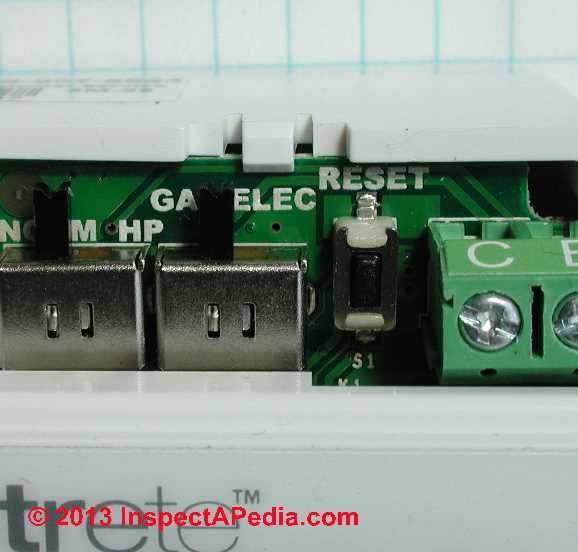 This setting is for systems that allow the thermostat to control the fan in a call for heat, if a fan wire is connected to the G terminal. Please just tell me which settings give the longest cycle on the CT87K. 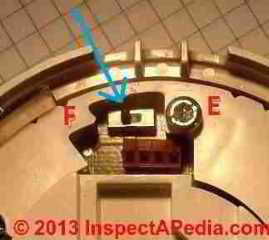 Fred, There is no traditional heat-anticipator adjustment as was found on some older thermostats we describe in this article series. We should simply follow Honeywell's recommendations for the CT 87K thermostat. In the CT87 owner's manual given below you'll see that the CT87N is for 24V Heating systems while the CT87K is for 24VAC heating and cooling systems - that is the K model controls both heating and air conditioning. 3. Illustration and table above adapted from Honeywell's CT87 Owner's manual cited here: Source: Honeywell Owner's Manual, CT87N / CT87K Round Thermostat, [PDF] Honeywell International, Inc., 1985 Douglas Drive North, Golden Valley MN, 55422 or in Canada: 35 Dynamic Drive, Toronto, Ontario M1V 4Z9, Canada, Website: http://yourhome.honeywell.com retrieved 2016/03/06. 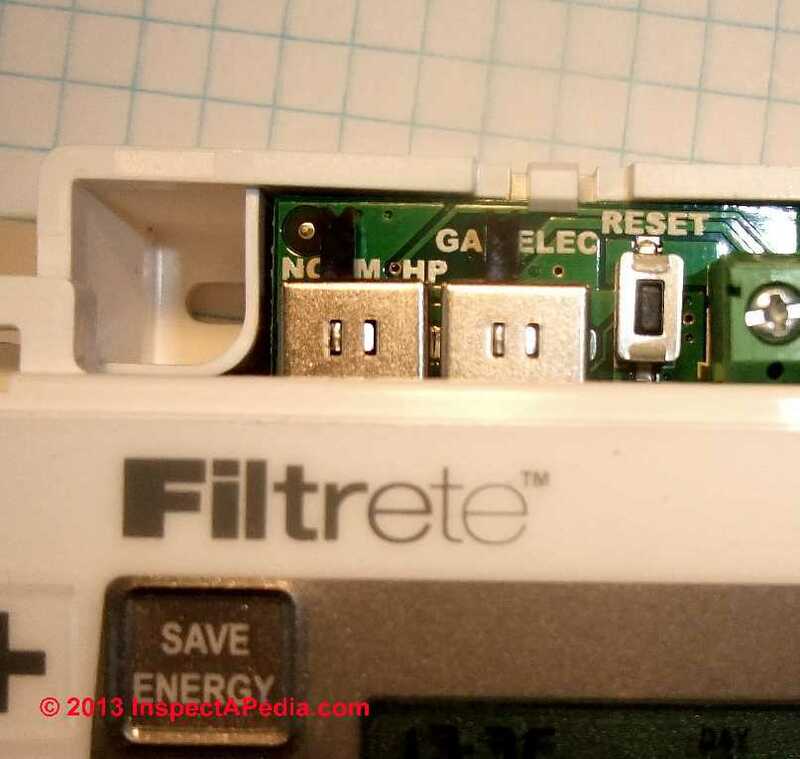 Watch out: the Filtrete™ 3M-22 is a battery-operated thermostat. If the batteries fail the thermostat may fail to provide heating or cooling and the building may suffer accordingly. An emergency backup heat control switch is provided for the 3M Filtrete™ 7-Day Programmable Thermostat Model 3M-22. 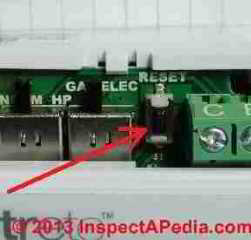 This switch is located at the top right side of the thermostat beneath the removable top cover. 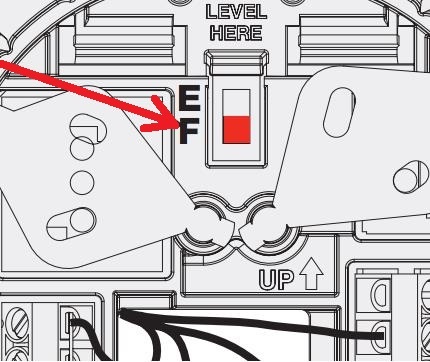 If you have set this thermostat for HP (heat pump - see the HVAC switch selections explained above), then an EMER or emergency function is available. This is a manual override switch. Set this switch to OFF (right) for normal operation. 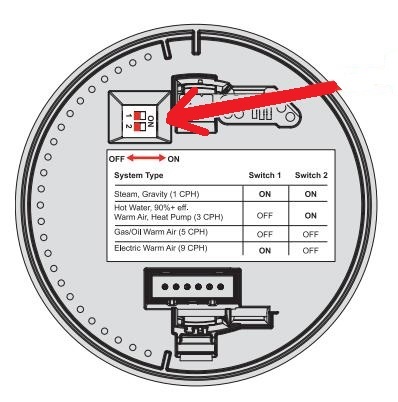 If you set this switch to ON or EMER (left) this will disable the heat pump and will mean that you are relying on your auxiliary heat or backup heat system only. This makes sense if your heat pump is in trouble or inadequate and you want to force backup-heat to be used instead. Watch out: as purchased, in our thermostat we found this switch had been set to ON (to the left) as you can see in our photo. 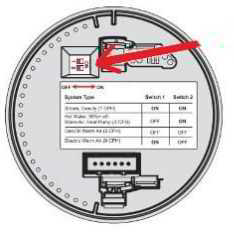 The 3M Filtrete™ thermostat also includes a hard reset button under the top cover and located to the right of the two HVAC switches discussed above. 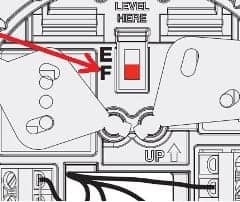 If your thermostat is not working properly, and provided you've already checked the obvious faults such as no power, bad batteries, loose wiring, improper settings, or manual switches in the wrong position, then you might try pressing this button. This will re-boot the 3M-22 thermostat without losing its pre-programmed settings. 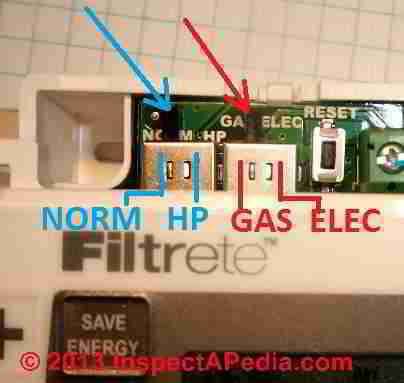 An alternative and more involved hard reset of the thermostat could also be performed by removing its batteries and disconnecting its thermostat wiring. Swing Rate: the desired variance in temperature between the 3M-22 setting and the room temperature before the heating or cooling system will turn on. The swing rate can be varied from 0.5o to 2.0o F.
Press SWING found under the DAY icon (second button from left, top row). Press the + / - buttons to select the desired swing from 0.5o to 2.0o F. Then press the Home button (leftmost button, bottom row) to store the setting. Watch out: unless you have bright light and good eyes the names, labels, and functions of the forest of setting buttons on this thermostat are quite difficult to read. Check to be sure you are pressing the correct button. 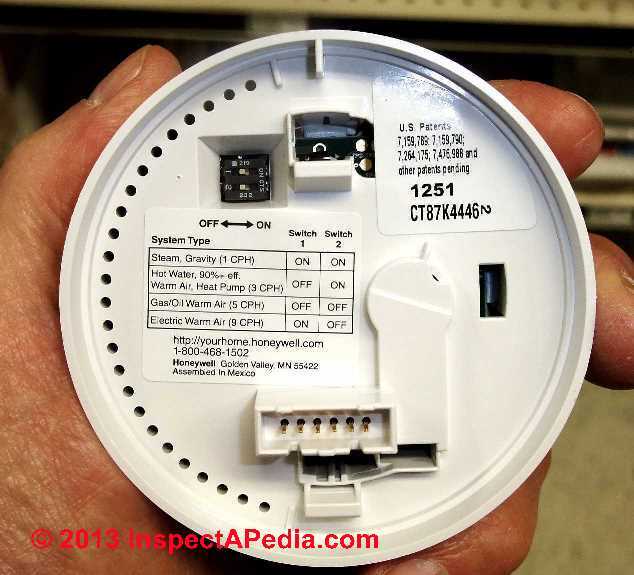 Watch out: this is a battery-operated thermostat. 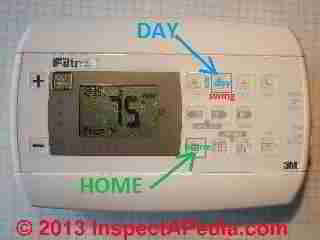 If the batteries fail the thermostat may fail to provide heating or cooling and the building may suffer accordingly. The 3M Filtrete 3M-22 thermostat also provides an optional adjustment to its temperature readout described as "calibration". The thermostat is factory calibrated to an accuracy of +/- 1o F but users can deliberately change the temperature display readout to be "off-calibration" by +/- 6o F.
The 3M-22 operating guide suggests you might want to do this to make the thermostat "agree" with another in the building or "agree" with the old thermostat that it is replacing - reasons that we consider ... well, frivolous. Imagine the confusion down the road when the next user goes crazy fiddling with the thermostat because it's "off" in temperature reading. There might be a more subtle reason that you'd deliberately change the temperature readout to an inaccurate number, following thinking similar to changing the swing cycle discussed just above. If the temperatures for the area being controlled by this thermostat always overshoot substantially past the thermostat's set point - something that might happen if the heat is provided by heavy cast iron radiators or baseboard - you could fudge the system by telling the thermostat that the room is warmer than it is. Similarly if a bad thermostat mounting location means it turns off the heat while the space is still too cold you might be tempted to fudge the calibration rather than moving the thermostat. 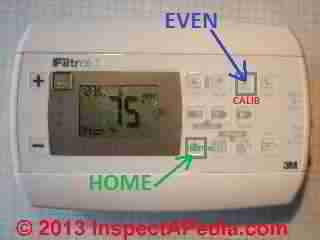 Frankly we think changing the calibration on a thermostat is usually asking for trouble and confusion. Leave the calibration where it was set by the factory. As we explain at THERMISTORS this thermostat is capable of very good accuracy.If your building temperatures overshoot, try adjusting the swing cycle discussed just above rather than messing with the thermostat's calibration. 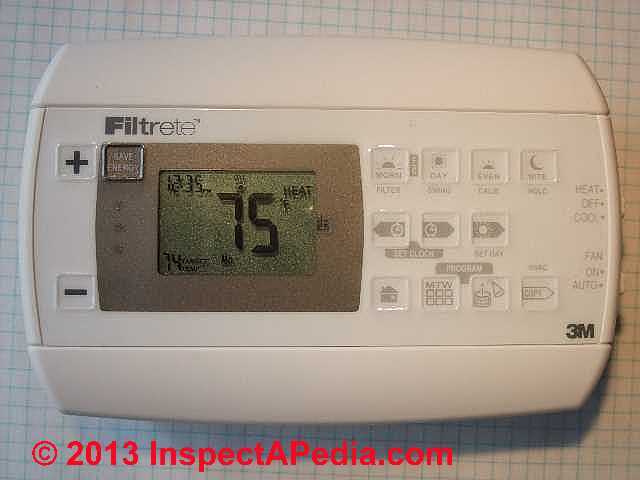 These examples will not necessarily fit other brands or models of room thermostats. Consult the installation and operating instructions for your individual thermostat. Contact us by email if you are unable to find instructions for your room thermostat. Continue reading at THERMOSTAT SWITCHES, EXTERNAL or select a topic from closely-related articles below, or see our complete INDEX to RELATED ARTICLES below. 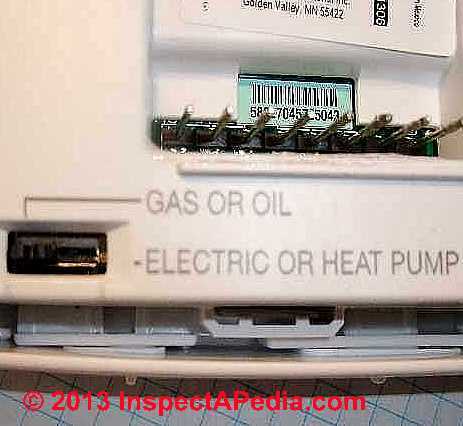 Or see THERMOSTAT SWITCHES, INTERNAL FAQs - questions & answers posted originally at the end of this page. At HEAT ANTICIPATOR OPERATION we explained that on some room thermostats internal switches are used to control the heating system on-off cycling rate, sensitivity, or fan functions in a manner that provides benefits similar to the heat anticipator found on other room thermostat devices. 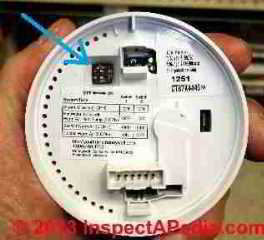 THERMOSTAT SWITCHES, INTERNAL at InspectApedia.com - online encyclopedia of building & environmental inspection, testing, diagnosis, repair, & problem prevention advice.